Movistar did not land either of its three GC riders onto the Tour de France podium, so it will try the same tactic at the Vuelta a Espana. 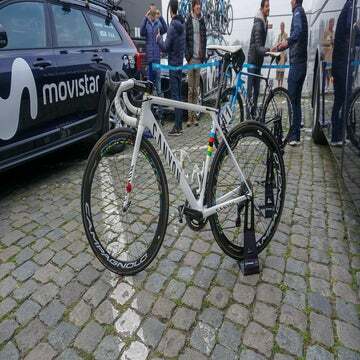 What didn’t work in the Tour de France will be Movistar’s plan of attack at the Vuelta a España. The Spanish team fell short of its Tour ambitions, but it will stick with the same game plan. Movistar will bring its unconventional three-pronged attack that fell short at the Tour and will hope it sticks at the Vuelta. Team boss Eusebio Unzué confirmed to VeloNews at the finish line of Saturday’s stage 20 time trial he will take all three of his leaders — Nairo Quintana, Mikel Landa, and Alejandro Valverde — to the Spanish grand tour that starts August 25 in Malaga. Movistar’s so-called “tricefalia” will ride again. Movistar fell well short of its ambitions for the Tour. The team won a stage in the Alps with Quintana and claimed its fourth team prize in five years, but it was never a serious threat for the yellow jersey in Paris. Some early crashes and losses proved costly to the team’s larger goals of trying to dethrone Team Sky. Quintana recovered from a stage 1 setback when he broke two wheels to win his first Tour stage since 2018. The Colombian suffered from heat and a late-race crash to finish 10th overall, his second-worst Tour result since his dramatic runner-up debut in 2013. 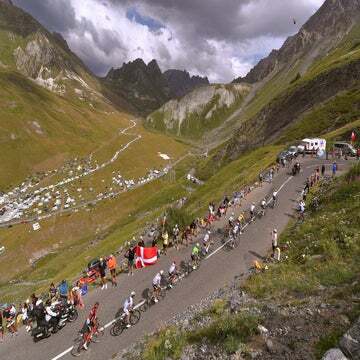 Valverde fell short of his goal of winning a stage despite a daring long-range attack that put him momentarily into the “virtual” yellow jersey in the Alps. The veteran, who is targeting the worlds in Innsbruck, will use the Vuelta to hone his form. Landa suffered from a heavy crash in stage 9 but fought back to a team-best seventh after finishing fourth last year with Team Sky. Both he and Quintana will target the overall at the Vuelta. Two riders in the top 10, a stage win, and the team prize would be satisfying for most teams. Movistar left the Tour wanting more, however, and vowed to take on the Vuelta even more aggressively. VN: How is the balance of the Tour for Movistar? EU: We came here looking for more than we have been able to achieve. It was a brilliant stage victory for the team with Nairo, but in the general classification, we had hoped to be able to be on the podium, but that was not to be. And I don’t want to explain it all away or attribute all of that to bad luck — which we’ve definitely had with the crashes for Mikel and Nairo. But we’ll move forward thinking about the things we have managed to achieve. VN: How did the three-leader plan work out for the team? EU: Starting with three leaders, they’re three guys who can contest the general classification; it’s not a problem of three leaders. If any of them had emerged at the top we would have supported him. It’s not a problem of three leaders. It’s just that our three guys, who were on a good level, were still far from the level of the best riders in the race. EU: Sky could have had three leaders too, had it not been for Bernal’s crash. It’s not a problem of three leaders. They’re quality riders. They haven’t been able to achieve everything they’re capable of. Like I said, I’m not going to blame bad luck for not being where we should have been. Sometimes that’s just sport. Today we were a bit off in this time trial and maybe we’re paying for doing a lot of work in many key days, which is probably why Mikel and Nairo were both a bit far off from the times we think they could have had in normal times. VN: How do you beat Sky? EU: Sky’s a great team and this year, again, they have the strongest rider. [Geraint Thomas] is a guy and a rider that has never had much luck in the grand tours but nevertheless has been the most brilliant and most consistent rider. He’s taken two stage wins so you can’t take absolutely anything away from him. He’s been the dominant rider with a team to protect him. VN: Movistar has a strong team, too, but couldn’t reach the podium, why? EU: The squad doesn’t make a rider stronger. A rider has his level. Yes, the team is important, if you’re indeed the best. The team isn’t going to make you stronger — your level is what it is. VN: Is Sky’s financial cloud a big advantage? EU: To have the chance to spend what you want and then achieve your goals, you just have to congratulate them. It’s more than just great riders. It’s the science and their system and they way they prepare. Each year it’s easier for them to achieve something at the Tour and harder for the rest of us.